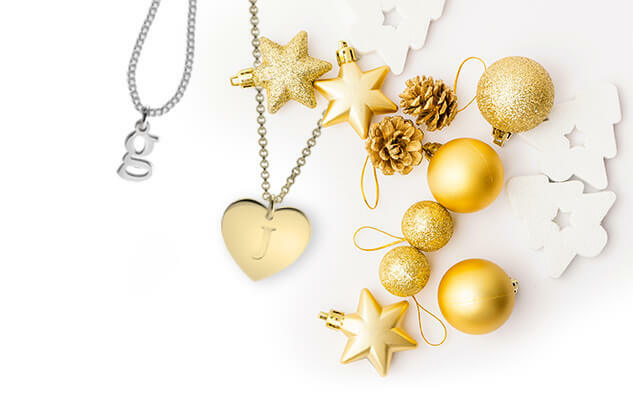 Whether you want to add a touch of personalized glamor to your life, or are looking for a lovely gift to somebody special, this Script Name Necklace is the perfect match for you. 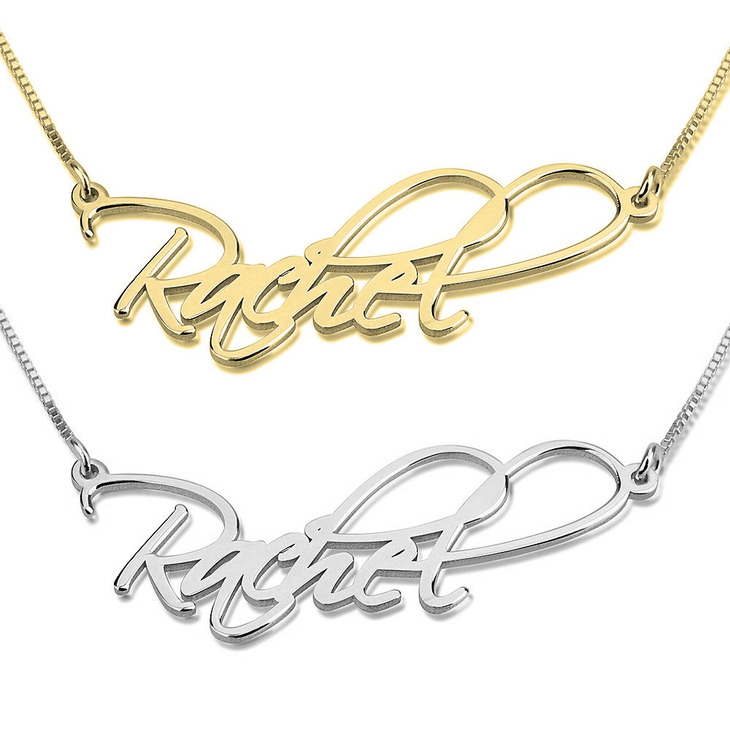 Any name or word of your choosing is elegantly crafted in an elegant script font to create a truly exquisite piece of jewelry that will dress up any outfit. Our products meet the highest standards of quality, crafted from solid sterling silver and available as well in rose gold and 24K gold plating. Order now, with free worldwide shipping! 43mm x 18mm / 1.7" x 0.7"
My necklace exceeded my expectations! The necklace arrived faster than I first anticipated as I was worried it might not make it for the celebration. Everything was up to the point in terms of quality and design! Love l,love,love!!! I love seeing my business name in a custom design just for me! I love my necklace and I’ve gotten so many compliments on it. This is my 5th or 6th necklace from Onecklace. They are awesome!!! I purchased this as a gift for my daughter. She loved it but unfortunately she broke it. I contacted customer service and they were kind enough to replace it free of charge. Well after a few months she lost the replacement so I went and purchased another one and it looks just as beautiful as the first two!! I hope they never stop making this nameplate with stunning lettering style because everyone who sees it also buys one!!!!! I pleased with the design. It's even more beautiful in person. I was impressed with the nice pouch and cleaning cloth that came with the necklace. I will definitely order again in the future! Fantastic necklace identical to the PLL series!! I got one for my daughter!! We both absolutely love it. Super joli ! Conforme a la description, livraison dans les temps. Chère Salomé je vous remercie pour votre note. Votre entière satisfaction est notre priorité. 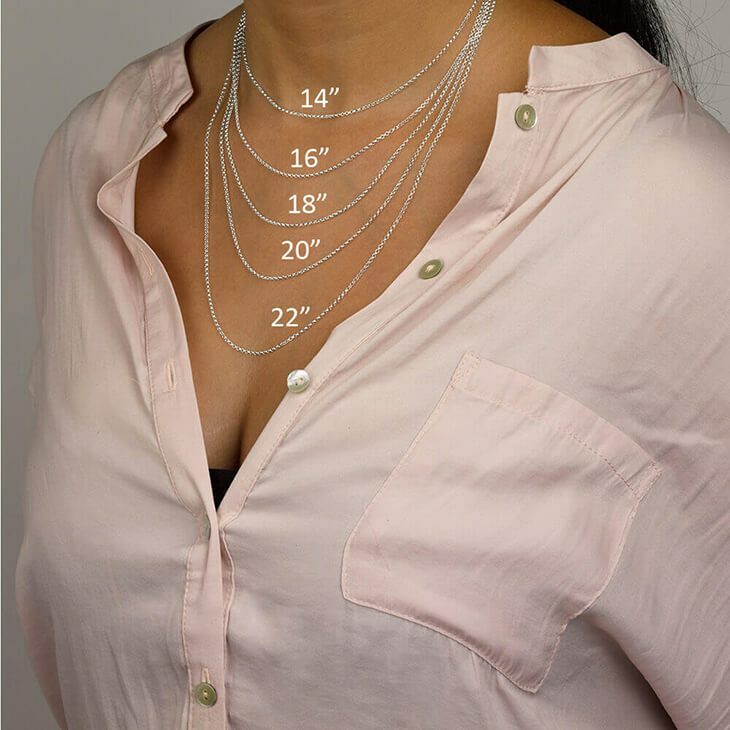 Pensez-vous que le collier est plus long à cause de la longueur du prénom? A ce propos nous vous conseillons de tenir compte de la longueur du pendentif au moment de sélectionner la longueur de chaîne. Quoiqu'il en soit je vous contacte par mail pour vous proposer une solution. Bien à vous! I just love this necklace so much. 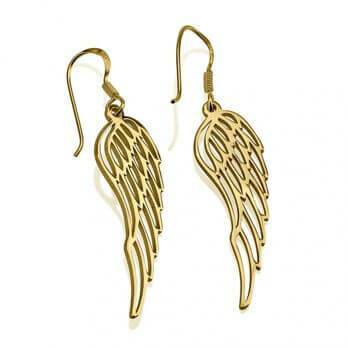 It's great quality and looks beautiful on. I will definitely purchase from here again! My daughter is huge fan of Pretty Little Liars and I noticed that they wore "name" necklaces and found that one necklace made them. I ordered the necklace and it is good quality and eye catching. My daughter wears it every day. The necklace is exactly as I expected it to be. The shipment is fast and the information given always accurate. They keep you well-updated about the status of your order. I am very happy with my new necklace and will order more in the future, definitely! She loves it, I love it. Only thing I could wish for is an example of the script before purchase. I bought this item add a gift and couldn't be more pleased. It's beautiful in person and the quality seems very good. My friend was delighted to receive this! I recently ordered this item with the 18" box chain. When I received it in the mail, the product was just as I had pictured but I was unhappy with the length of the chain. I contacted customer service and they couldn't have been more helpful. I was able to send it back and exchange my necklace for a new one with a 16" box chain as I felt this length suit me better. I am in love with my necklace! My mother even ordered one as well because of how much she loved mine. I am looking forward to ordering from ONecklace again in the future. This necklace is just beautiful. When I received it I was thrilled. I've bought a name necklace for here before and I was kind of upset at how flimsy it was but not this one ! It is very sturdy and has a beautiful rose gold colour. I am so glad you are happy with the quality of your new rose gold necklace, but I'm sorry to hear you were unhappy with the quality of your original necklace. I have contacted you about possibly be interested in sending this gold plated necklace back to us and we can remake this free of charge in double thickness. We await your response if this solution will work, as we'd like to ensure you are 100% satisfied with your purchase. 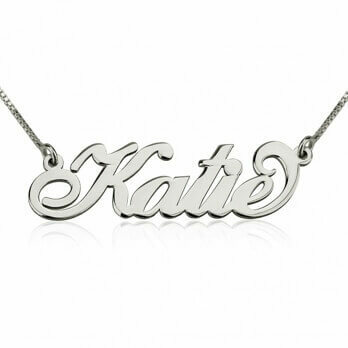 It's a quality necklace, but I would ask to see how your name or word before ordering the Script Name Necklace. My daughter's name looks slightly odd. We would order again. Also, I would suggest that you put a photo of the alphabet so people would see the letters. I love my name plate necklace in rose gold. I get comments on it constantly. The customer service reps are also very kind and helpful. The Post Office lost my order and customer service were patient and resolved the matter swiftly. I will definitely be buy more products from Onecklace. Very good experience: Fast fabrication and delivery. I love that is it not chucky like most name necklaces, instead it is delicate and more feminine. 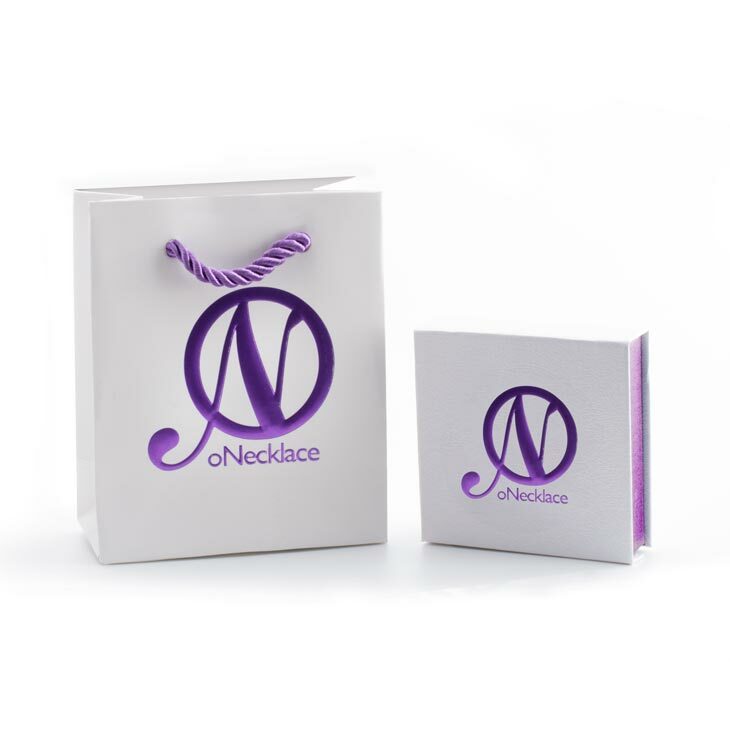 I simply loved the design, I chose a scripted name necklace with a box chain and the quality was really great. The name plate is sturdy and doesn't bend easily so I don't have to worry about it when I wear it everyday. The collection in the website is simply amazing. I definitely plan to purchase more designs soon. The only thing that I wasn't satisfied with was the additional cost for shipping. Since I'm an international customer, I wish Free Shipping was an option. Otherwise, extremely satisfied with the purchase. I was very well pleased with the necklace. I can't wait to give it to my granddaughter on Thursday. Just stunning! I always get compliments on the script lettering. Has not tarnished yet and have used it several times. Beautiful item. Myself and my best friend really like them! I purchased this necklace for my daughter after seeing them on PLL It did not disappoint. Unique font on the name and the rose gold is very pretty. 5 stars a crossed the board. I received my necklace in a timely fashion and it was exactly what I ordered!!! I will definitely order again!! I had brought a silver necklace with my name on it.. After wearing it for about a week the necklace broke! I can't lie it is a very pretty necklace but it is poor quality & very flimsy!! Thank you for bringing this to our attention. We are so sorry to hear this has happened. We have emailed you to see how we can fix this for you as it is not up to our standard. We would love to have a new necklace send out to you. Please email our customer service team back to set this up. Thank you. I was so excited to receive my necklace in the mail and once I did it was like "Love at first sight". However, I've been wearing it for almost a week and noticed that the silver is fading. The whole necklace is starting to tarnish which surprises me because I don't wear it when I shower. I really wanted to give a good review of this necklace but I'm disappointed with the outcome. 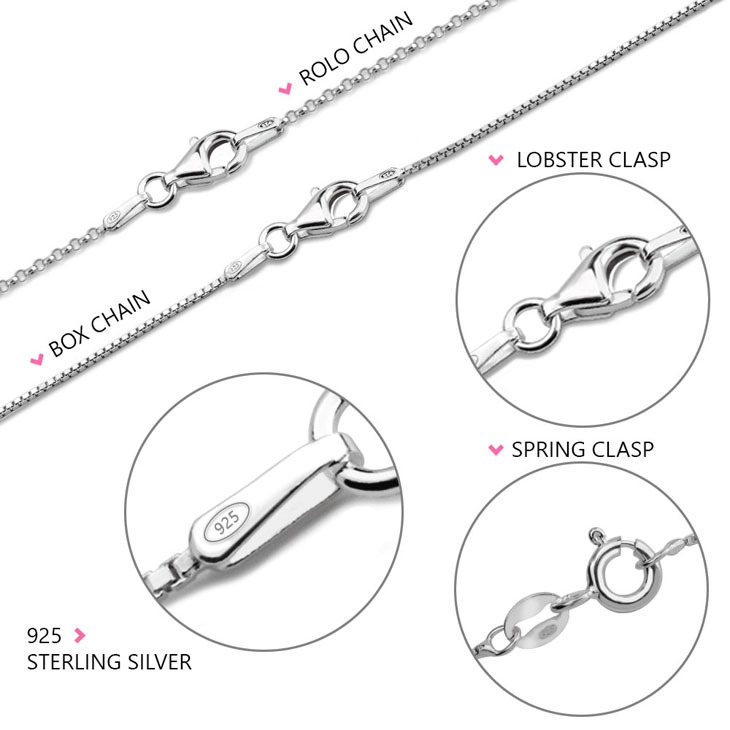 The silver used in all our products is the highest quality 925 sterling silver. Tarnishing is a natural process that occurs with time depending on the oxidation in one's body. The best way to clean your necklace is with a silver polisher you can find in any supermarket. There are even polishes that can delay the process of tarnishing. Bought these for our three daughters as Christmas gifts. They all loved them - ages 24, 14 and 9. The youngest never takes hers off! Appears to be excellent quality, durable, and absolutely beautiful. Will be ordering one for myself! Necklace was very detailed and great price. I love my necklace, very nice quality...The font is beautiful. I absolutely love this necklace! The quality of the finish and the actual chain exceeded my expectations. The necklace has weight to it. Several people have complimented the necklace. I am extremely happy and will definitely be back as a repeat customer! I am very happy with my name necklace purchase. The quality is great and the font is beautiful. I receive so many compliments when I wear it. I will be a repeat customer for sure! I LOVE MY STERLING SILVER CURSIVE NECKLACE. I WILL BE PURCHASING AGAIN SOON. I ordered the Sterling Silver Script Name Necklace and I love it! It is just the perfect size, very beautiful and I receive a lot of compliments on my necklace. The service online is very simple and user friendly. The delivery took just a few days. I received the necklace carefully packed with a certificate on the silver quality. I am very satisfied and will certainly recommend this work! I have several different styled necklaces from this seller. This one is just as beautiful as the others. I've gotten many compliments on this necklace as well. This turned out beautiful in its looks. I purchased this item for my 12 year old daughter. However, I think it needs more weight to it, maybe a bit thicker. Also it should have a heavier chain. I am worried that she might break the chain. I was waiting two weeks for this beautiful necklace! I'm glad it looks so good! Thank you so much for doing so cute necklaces:-) i am very satisfied with my name necklace and i am sure, that this is not my last order to make on Onecklace. Love my necklace it's exactly what I thought and more. Thanks. The only thing I didn't like was the fact that you can't preview your name in your chosen font. Everything else is perfect! Love my new signature necklace! I am so happy with my purchase. I get so many compliments. I ordered the chain in 18" and my name rests about two fingers below my collar bone. 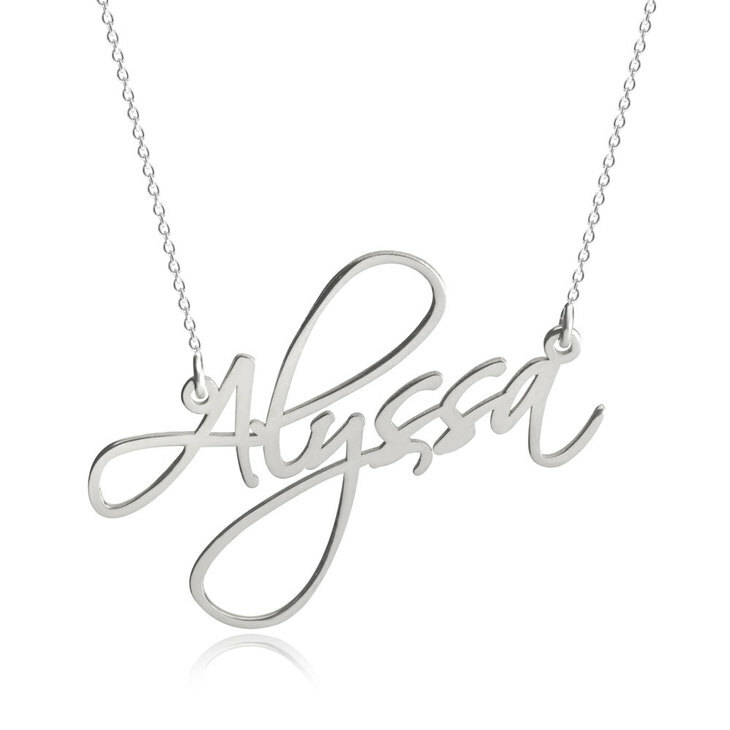 I took a chance ordering this necklace without knowing how it would turn out but I believe this font allows any name to look beautiful. I will definitely recommend this website and will be shopping here again for gifts. At first I noticed Silver Script name necklace on the girl in the office- it was small but delicate detail and I ordered gold plated one for myself and after receiving it, wearing and noticing how good it was I ordered it for my friend as names day present and she admitted "it is rarely beautiful present she has ever got"
Great necklace and super fast delivery, highly recommended! Great quality good-looking silver necklace. Thank you very much! Necklace is so classic and beautiful! Dainty, feminine necklaces are all the rage this season. The necklace is so beautiful and intricate , plus I finally have one with my name on it! It's hard finding "Colleen" at a normal jewelry store. I love it and wear it everyday! :) Would definitely repurchase from here again, and that's saying a lot because I'm a picky shopper. I'm very happy with the materials and necklace overall!